Now you can become a real hunter of hidden chests. The Simple Chest Finder 1.8 is a fairly simple mod that allows us to locate chests around the world. That is, if under the surface of the world is a hidden chest with this mod we will be able to view it on our screen. Operation is as simple as the mod itself, once installed we will mark chests by colored exact points where there is a chest, that is, we can not enable or disable the function. 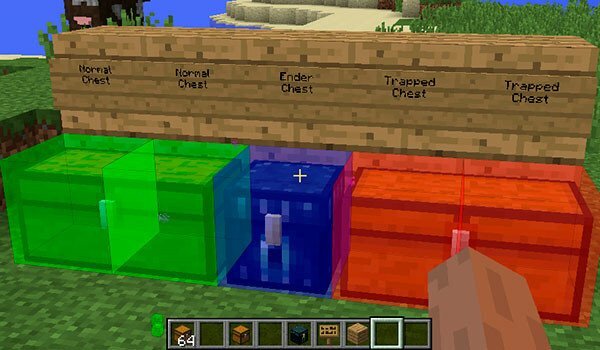 If the box is green, indicating normal chest, if blue, indicating a chest of Ender, while if it is red indicates a “trapped chest”. How to install The Simple Chest Finder Mod for Minecraft 1.8? The tool you need to find hidden chests!